It’s tasty and both my husband and eldest daughter gave their THUMBS UP! Heat about 5 tbsp of oil in a wok. Stir fry the toasted belacan and the chili paste till fragrant. Add in the eggs. Mix well. Once everything is cook, can off the fire and it’s ready to be serve. 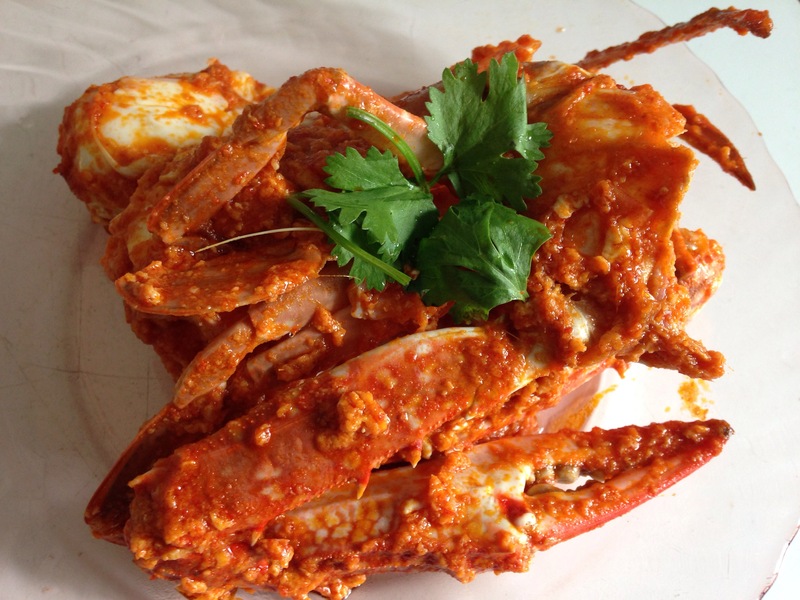 Part of today’s menu is Ketam Berempah (Crabs cooked in spices). The recipe is simple and frankly when it comes to crabs …. whatever way you choose to cook them, definitely delicious! I usually avoid cooking crabs, not because I do not like them but rather for my eldest daughter’s sake. She loves crab but unfortunately when she ate even a little of the flesh, there will be an allergy reaction. So today, I told her that she could eat the crabs but unfortunately she has to stay indoor until the allergy reaction subsides. Her reaction to my comment was comical to say the least hahahahaa…. – Fry the blended ingredients till fragrant in a wok. – Add the tumeric powder and tamarind juice. Stir a bit. – Add salt and sugar to taste. – Finally, add the crabs. Stir well and close the wok with a lid for about 5 min. – Open the lid, and stir well again. Close the lid. Repeat till crabs are cooked. – Once crabs are cooked, off fire. Ready to serve with rice and other dishes. This dish became a favourite of our family after we ate it at my 3rd sister’s. It uses a pre-mix chilli crab paste from Prima and instead of using crabs, we replace it with mussels. It works! Very spicy and flavourful …. Yumss!!! Besides, using either crabs or mussels, you can also use clams if you want. 1 kg of mussels – soak with salt water, rinse and clean thoroughly and then boil for about 5-10 mins. Heat the oil in a wok, fry the onions, lemongrass and bird’s eye chillies for about 5 mins. Then add in the Prima Chilli Crab paste, add water and stir well. Add in salt and sugar to taste. Then add in the eggs and stir well. Finally, add in the mussels and mix them well with the sauce. Ready to serve with hot rice.